How far would a man go in the name of faith? 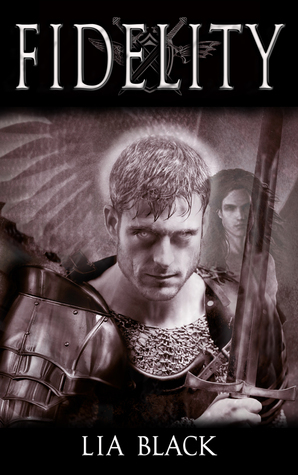 Fydelis was once worshiped as the Angel of Fidelity, but his love for Gareth, a mortal knight, caused him to fall from the heavens. He has now become the demonic aspect of Regret, and the unwilling plaything of the Sunderer, the darkest of all dark gods. His only hope is for death, but first, he must find someone to take his place as the Sunderer’s favorite toy. Father Gareth De'Aubyn is a man tormented by his past and ready to sell his future to save the souls of his flock. Questioning the wisdom of war, he’s traded his Crusader’s armor for a cassock, and now ministers to the very people his army sent fleeing for their lives. When his church is attacked by unknown assassins, Gareth is mortally wounded, and with his dying breath, he calls out to the Creator for help. But his god does not answer. Instead, the demon, Fydelis, heeds his call, cajoling him to promise his soul to the god of the underworld for a chance to tap into the powers of dark magic, and set everything right. A stranger to Gareth, the man who once swore to him his honor and his love, Fydelis is forced to make the dying priest an offer he can’t refuse: in return for sparing the lives of those under his care, Gareth must collect several very stubborn souls. Together, they’ll begin a journey that will test everything they thought they knew about faith, love, and fidelity. Father Gareth De’Aubyn, former Crusader, is wracked with guilt for his part in the destruction of innocent lives. Now a priest, he has an opportunity to repair some of the damage he caused and atone for his sins. When Gareth is gravely wounded during an attack on his church, his pleas to his god are answered by the demon, Fydelis. In return for Fydelis’ help in saving his life, protecting his followers, and seeking vengeance against his attackers, Gareth must sacrifice his soul to the Sunderer god, Malaketh, a nasty piece of work and Fydelis’ master. Fydelis isn’t just any ordinary demon, though. He was once Gareth’s guardian angel, and just because he now possesses cloven hooves and a forked tail doesn’t mean he stopped having feelings for Gareth. I’m watching Supernatural now (yeah, I know I’m late to the party) and was keen to read a story about a regretful priest and the reluctant demon that turns his life upside down. The story went down as smoothly as a mug of cheap lager, pleasant tasting and drinkable. - The slow-burning romance between Gareth and Fydelis, two broken men who must overcome the difficult hurdles of loneliness, regret, and grief. - The humorous banter between Gareth and Fydelis that offset the violence and despair. - Gareth’s unshakable faith and kind heart. - Gripping and well-paced story. - One-dimensional villains. I would have liked some insight into the minds and motivations of Malaketh and General Karathis. - Fydelis’ telepathic ability was interesting, but not fully explored or utilized. Similarly, his ability to enter Gareth and direct his actions. - Interesting minor characters, like Yeol Havram and Paetrik, deserved far more page time. - The graphic physical and sexual torture of Fydelis by Malaketh felt distracting more than disturbing. Because Malaketh lacked any depth and Fydelis did not appear to be permanently affected, these scenes failed to have any impact on me. - Errors, plot holes, and incoherency in places made this a sometimes frustrating read. Does Fydelis have a soul? By the time I finished reading, I was fast forgetting details in the story. It felt just like getting to the bottom of that mug of cheap lager and yearning for a richer, more full-bodied beer.